Although I have removed the usual library‑book spells from this volume, I cannot promise that every trace has gone. Madam Pince has been known to add unusual jinxes to the books in her care. I myself doodled absent‑mindedly on a copy of Theories of Transubstantial Transfiguration last year and next moment found the book beating me fiercely around the head. Please be careful how you treat this book. Do not rip. Appearance: thin, rather beak-like nose, looks like an underfed vulture (CS10), shriveled face (OP29), vulture-like (GF26), sunken cheeks and skin “like parchment” (HBP15). Field: librarian, old-fashioned version (“guardian” of the books). Interests: following rules, protecting her books from nasty, scabby little students. Pince=French for "pinch," as in "pince-nez" glasses, an old-fashioned type that stay on by pinching the nose at the bridge. 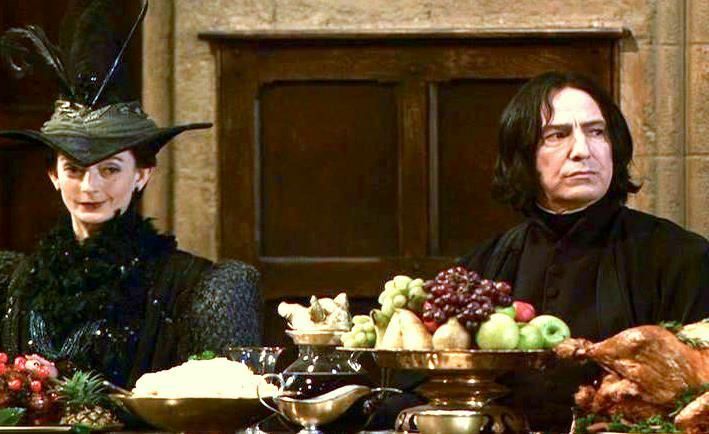 Fan Theory: Irma Pince is the topic of an interesting fan theory concerning Severus Snape's mother, Eileen Prince Snape. Many have wondered if Snape asked Dumbledore to protect his mother from Voldemort after he returned to the good side. If so, what happened to her? She is missing from Spinner's End, and unfortunately Snape's memories in the Pensieve tell us nothing more about her. Well, the theory goes that Eileen Prince was transformed into Madam Irma Pince, the Librarian at Hogwarts, since it would be easier to protect her there without drawing much attention. What are the clues? For one thing, "Irma Pince" is an anagram for "I'm a Prince." Another is Irma's appearance: "a thin, irritable woman who looked like an underfed vulture" (CS10), which is very similar to Eileen's "thin," "sour," and "cross" appearance (HBP25, DH33). T hree, Madam Pince was mentioned humorously in Dumbledore's Introduction to Quidditch Through the Ages, clinging to the book she did not want to share with Muggles (QA). In Philosopher's Stone, Snape took the same book away from Harry, telling him he wasn't allowed to have library books outside the school, which Harry thought was a made-up rule (PS11). While it's true that Snape probably didn't want Harry to read up on Quidditch before a match with Slytherin, he also sounded very much like a librarian himself. And it would make sense that he got his bookish ways from his mother, since their house in Spinner's End had wall-to-wall books (HBP1). Finally, one interesting visual clue comes from the Chamber of Secrets movie. For some unknown reason Snape was seated next to Irma for a colorful publicity shots, and there is certainly an interesting resemblance. This never happened in the books, and some might say because they look too much alike and Hermione might have put two and two together (if it's true, that is).